Background: Computational analyses have helped understand jet noise and mixing in qualitative terms. In particular, the vortex dynamics with and without actuator control have been elucidated in great detail. Problem: Computational results often underestimate the length of the jet core. Possible causes include grid resolution and turbulence model. However, the main issue may be mis-match between the boundary layer on the nozzle wall. Experimental measurement of this profile is very difficult. Background: Low frequency oscillations in shock/turbulent boundary layer interactions have the potential to cause significant fatigue loading. Effort: With AFOSR support, an extensive study is being undertaken (with Prof. Samimy, who is performing experiments) to understand and control these oscillations. Preliminary results have been presented at NASA Glenn SBLI workshops in 2010 and 2011. We hope to expand interaction in the near future. Sustained high-speed air-breathing flight presents major opportunities for both commercial and military application, particularly when viewed as a component of a routine access to space strategy. The aerodynamic challenges are however substantial. On the external airframe, complex phenomena such as transition to turbulence and shock/turbulent boundary layer interactions generate massive thermo-mechanical loads. The internal propulsive flow path is characterized in addition by short residence time of the air, which hinders proper fuel air mixing and combustion. 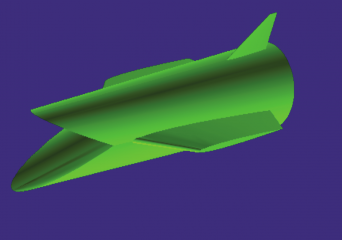 Our effort is focused on using high-fidelity computational approaches, tightly integrated to both ground and flight tests, to enable the design of the next generation of high-speed vehicles through knowledge of the fundamental physics. We are currently using massively parallel computer systems of the Department of Defense and the Ohio Supercomputer Institute to understand many of the most complex problems. 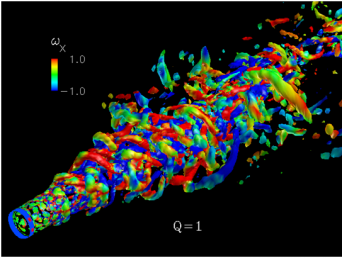 Together with the Gas Dynamics and Turbulence Laboratory, we are exploring advanced plasma-based control techniques to reduce noise generated by supersonic engines and methods to enhance fuel air mixing. 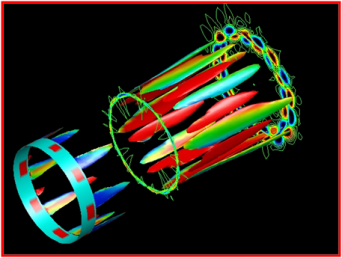 The simulations are being employed to elucidate the coherent structures introduced by the actuators and the manner in which they interact with the environment. 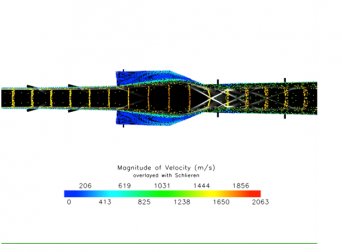 We are also performing large scale simulations for the HIFiRE project – a joint US-Australian ground and flight test program exploring the key aero-propulsive phenomena in hypersonic flight. Our efforts are providing key insight into the physics by explaining the observations to date and guiding the evolution of future efforts. N. Mullenix and D.V. Gaitonde, “Shock/Boundary Layer Interaction Simulations at OSU,” NASA Glenn Research Center, April, 2011. D. V. Gaitonde, “High-Fidelity Analyses of Innovative-Inlet-based Scramjet Flow-Paths,” Invited Presentation (Plenary), DoD User Group Conference, San Diego, CA, June 2009. D. V. Gaitonde, “USING CFD TO UNDERSTAND FLOW STRUCTURE,” Special Lecture to Graduate Students, Air Force Institute of Technology, Aug. 2009.